The Console makes it easy and efficient for organisations to store, update and track the status of Information sharing and available to use by health and care organisation​s in London. Why use the Data Controller Console? 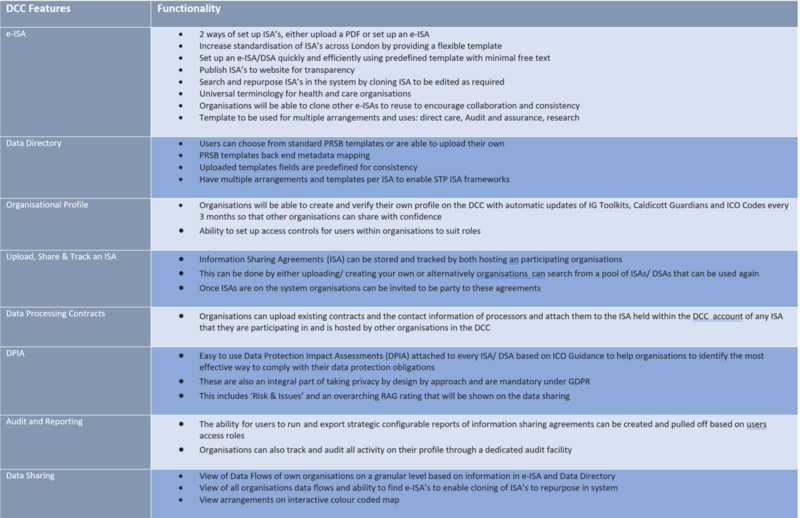 The DCC increases visibility of agreements between organisations that share information, it also gives real time access to Information Sharing Agreements (ISAs) and control over any changes made to the ISAs. Who are users of the Data Controller Console? The main users of the console are information governance managers/leads (and their teams) in health and social care organisations such as hospitals, care providers, practice managers in GP practices and local authorities. Adults and Children’s social care share vital information with NHS organisations to provide care for citizens. The DCC has been aligned to meet the needs of these organisation so all can use with confidence. How do i Register your organisation on the DCC? Once your organisation has joined, the authorised contact person/s will receive their login details with temporary password which must be changed on first logon. An invitation to join the DCC will be sent to the Caldicott Guardians/IG managers of your organisations via the “no-reply@datacontroller.london”. This email will have instructions of how to set you organisation up on the console. The DCC training team offers a range of free sessions tailored to your needs. These sessions have been designed to be flexible enough for users to book onto wherever they as they are delivered via WebEx and can be accessed remotely. We also run free drop in sessions and workshops that focus on a particular module or feature of the console which gives the users the flexibility to decide what session they would like to join. To Join any of our workshops or training sessions, please contact us via “England.dccsupport@nhs.net “ with the title of the course you are interested in and we will let you know the dates and times, you are able to book onto the one that suits you. We also publish a calendar of sessions in the monthly newsletter which is distributed to all registered users. 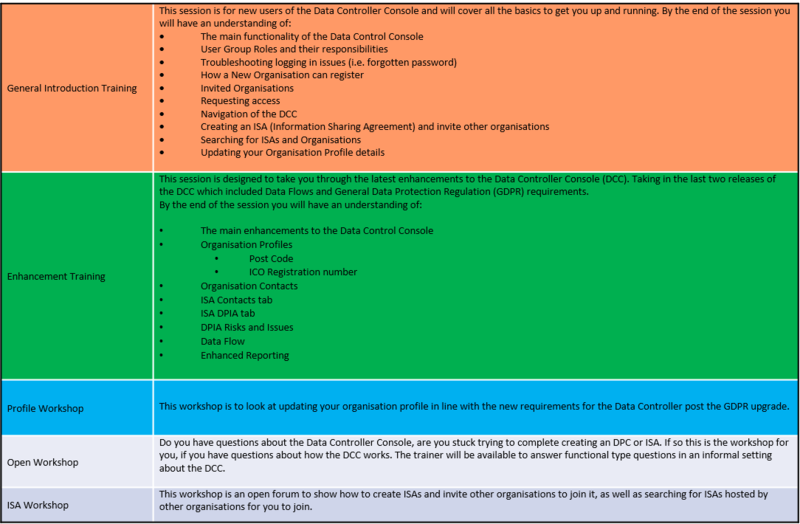 In the meantime if you would like to learn more about the Data Controller Console, please follow the link to our training materials or download the DCC Flyer for further information. Coming Up…….Future Enhancements to the Data Controller Console. The central DCC team will continue to enhance the console to make it a more efficient and robust tool.